Before I begin, this post is for my friends who agonise in my Instagram or twitter whenever I post pictures of my homemade eggs with runny yolks. They often ask me, “How do you make those eggs?” to which I jokingly answer, “with great luck,” before adding “and a bit of patience.” Getting these eggs right is no joke and it has taught me that it takes love and patience to just cook one single ingredient right. Eggs should be a bit old (older than two weeks from the farm). Place the eggs when the water is boiling hard. Use a timer to get the right cooking time. Prior to this article, I’ve experimented with many cooking techniques. Adam Liaw, for example, suggests that it’s easiest to steam the eggs instead of boiling it. Others prefer to boil the eggs cold along with the water. My problem with these techniques when I tried it at home is it’s difficult to figure how long to cook the egg because the initial temperatures (from the egg, to your steamer, to even the temperature of the room) are varied. Hence, there is a tendency to undercook the eggs or overcook them. Out of all the techniques I’ve tried, these tips from Serious Eats yielded consistent results and raised my success rate to 85% which is not bad all. Before I go into the deets of how I make eggs, let’s watch how a Japanese chef prepares his aji tamago! This is possibly the easiest one I’ve seen online and one closest to what I do in terms of boiling the egg. One of the things I don’t do in this video is poking the egg before I boil. This ideally brings some of the heat in the shell in hopes of evenly cooking the egg white. But I don’t necessarily do this because, to be honest, I’m not careful enough not to mess up the egg shell. I’ve had moments when I poke the needle too much that the egg white started seeping out. Sometimes a small poke cracks the entire shell. 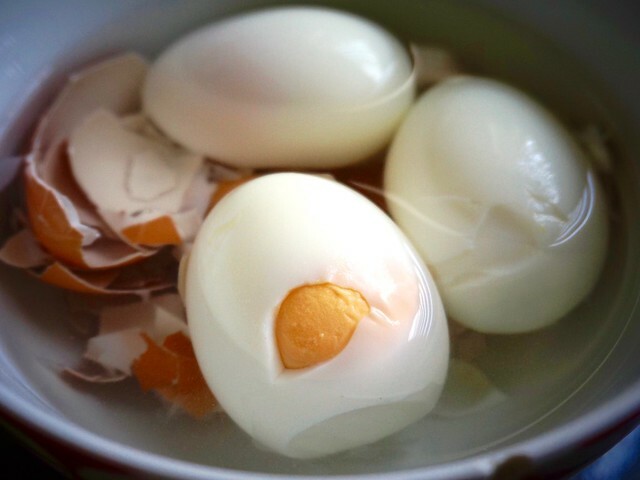 That technique can be avoided if you use a slightly older egg where the egg whites have somewhat separated itself from the egg shell’s membrane and if you properly cool your egg. I also don’t boil my egg for six minutes to account for the residual heat of the egg when I transfer it from the boil to the cold water. The flavouring of the egg is really a mix of what you want to flavour it with. You can use his recipe or you can also use mine later. I also wanted to show the texture of the egg once it’s been cooked. It should be squishy enough but not too soft that it breaks or too hard that you can’t see a proper squeeze. With all of those things I’ve read and seen, this is the technique I’ve honed to make my eggs with runny yolks. It’s been fine-tuned to my experience and might be applicable to you if the conditions are right. This also works for me when I’m not in a rush and my head is clear, and when I’m not too hungry. A small sauce pot with enough water that when you place the egg in it, it’s fully submerged. You also don’t want too big a pot. I think it uses up a lot of unnecessary heat. Fill a bowl with tap water and submerge your cold eggs. Leave in that bowl for a long time until the egg is at room temperature. You know the egg is at room temperature when you hold the egg and it doesn’t feel cold in my hand. Start boiling your water in a pot and once it goes into a mad rolling boil, drop the eggs carefully with a spoon or a ladle. Place a bowl under the tap and fill it with water. Once the timer rings, spoon the eggs to the bowl. Cool the eggs in the bowl under a running tap for 1-2 minutes. Timer here is not required. You can leave it longer if you like. When the eggs are cool enough to touch with your hand, crack the bottom and leave it in the cold bowl for another 3 minutes or more. It doesn’t really matter how long. What’s important is the egg is back to room temperature before you even start peeling. You know if the egg is at room temperature when you hold the egg and you can barely feel the warmth emanating from it. Peel the egg carefully and feel free to serve it in your noodle or marinade it in soy sauce. Not all eggs come easy. I still mess up some eggs every now and then. Cooling the eggs is key to getting that clean egg white. If the whites are still warm, there’s a strong chance that it’ll stick to the membrane and I won’t get to have a nice clean peel. The residual heat in the egg is quite critical to the process too hence I had to adjust my cooking time from 6 minutes to 5 minutes. The 5-minute mark might not be what our Japanese chef prescribes. The 6-minute egg is perfect if I’m eating it on that very day and if I shock the egg in ice. Unfortunately, those are not my everyday conditions. I don’t want to waste a tray of ice just to cool eggs and since I cook for one, I don’t eat all those four eggs in a day. This recipe is based on the notion that I am soaking my eggs in a marinade for one or a few days in my fridge. This means that I can prep this batch on the weekend, keep it in my fridge for a week, and then every time I get my egg, I always get the runny yolk. This saves me from having to cook my egg each and every time. The problem with the 6-minute egg is that once I keep it in the fridge, the yolk kind of hardens and so it’s not as oozy as the 5-minute egg. The five-minute egg is perfect for my bento and runny yolk needs. This is an aji tamago marinated for four days in my adobo. It’s still somewhat runny which is awesome on top of piping hot rice. The flavouring I use for this is usually a diluted left over or a smaller version of the Chinese marinade I use to make roast chicken. You can even add it in your adobo once it’s cold! 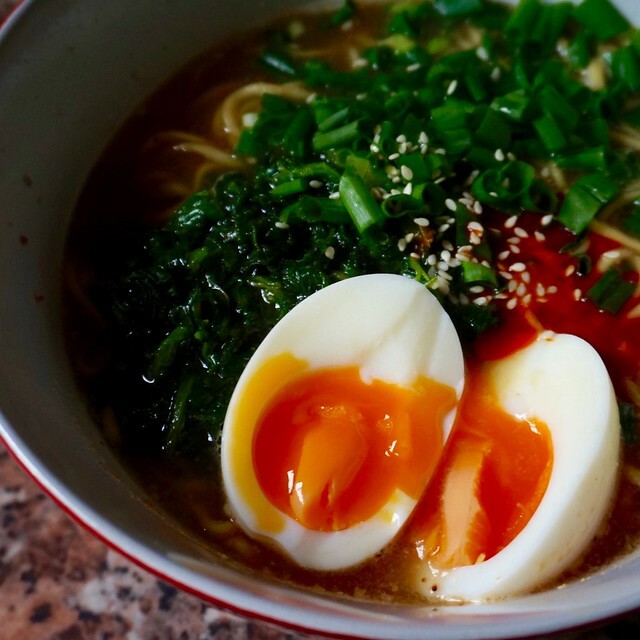 You can also use diluted mentsuyu or black tea with soy sauce for these eggs. 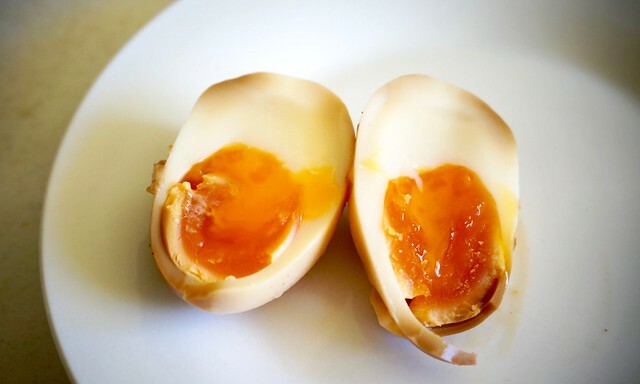 You can even try wrapping the egg in miso to kind of ferment them into a miso egg. Just… don’t keep the egg in miso for a week as it’ll be too salty. Again, it’s up to you how you want to flavour your eggs. The key here is to place your eggs in a cold marinade so that it doesn’t cook. Anyway, that’s my trick to getting runny eggs. To be honest, it’s not a perfect technique and I still get a few misses. But this is the technique that’s given me a good 90% output given the conditions are right. I am not even sure if this technique is going to work for you at home since your eggs might be different mine. You might have to learn to adjust the boiling time based on your eggs. For example, a friend of mine in the Philippines boils her eggs for 4 minutes and 30 seconds to get this result. I’ve tried boiling eggs for 6 minutes in Manila and I get a full hardboiled egg. So you have to experiment a bit with your egg, especially with its cooking time. I think 5 minutes is a safe zone but requires a bit more patience to get the perfect result. After this, the next big hurdle is onsen tamago which is another egg perfection on its own. I hope that doesn’t take me three years to finish!